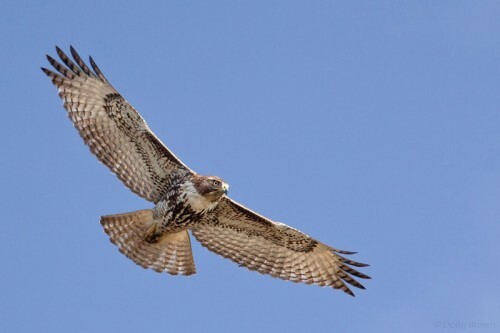 Red-tailed Hawk /Hawks Aloft Inc.
Raptor migration is at its peak in New Mexico as eagles, hawks and falcons utilize the updrafts along the north-south mountain ranges on their way to wintering grounds farther south. This juvenile Red-tailed Hawk embodies the ID characteristics for the species: a dark belly band, dark head, and dark patagial marks. However, juveniles wear banded tails and will not acquire the diagnostic red tail until their first molt at age one. Note the prominent wing windows near the outer edge of the wing, also diagnostic for first year birds.